There are two separate casitas both have en-suite bathrooms, inside & outside sitting areas. The casita that is above the gymnasium also has a kitchenette. All bedrooms have access to the pool from their terraces. The gymnasium has all the weights you‘ll need, plus a small gym with 1 treadmill, 2 elli magnetic bikes and weights. The kitchen is fully stocked with modern appliances & items to make your cooking experience easy. You have access to the pool from the kitchen & quick access to the outdoor gas BBQ. 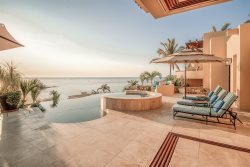 You’ll love living outdoors with the wonderful amenities Casa Sahuaro has; Swim up palapa wet bar, outdoor dining area, outdoor shaded living area, fire pit, infinity edge pool & Jacuzzi & lots of areas to sun. You are just a few steps to a private cove, where we can probably bet you won’t see anyone! Casa Sahuaro & your LIFESTYLE team are waiting for you.